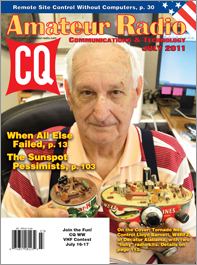 The July issue of CQ starts out with our view on the dangers presented by H.R. 607, a bill that not only would force the reallocation of two-thirds of the 70-centimeter ham band but that poses additional threats to homeland security, public safety communication, business communications and personal two-way radio communications. This month's "Zero Bias" editorial explains the points made in our letter to the bill's sponsor, Rep. Peter King, Chairman of the House Homeland Security Committee. Next, we share accounts of the amateur radio response to the string of tornadoes that tore through the southeastern U.S. in late April in KI6SN's "Public Service" column. After that, we return to the fun part of ham radio, reporting the results of the 2011 CQ WPX RTTY Contest. Once again, this year produced a record number of log entries, 191 countries on the air and over 2000 prefixes active. Top scores were posted by P49X (W0YK), PJ4R (N4RR), TM3T, RY9C, 9A1A and 4O3A. Congrats to all! 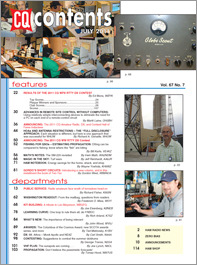 We also have the rules for this fall's 2011 CQ WW RTTY DX Contest. Moving to the technical side of our hobby, noted DXer Martti Laine, OH2BH, introduces one of the latest projects of the hi-tech Radio Arcala group in Finland, the ability to control a remote transceiver over the internet using a second radio - rather than a computer - as the interface. One reason for needing remote control is the growth of antenna restrictions in many areas. Richard Genaille, W4UW, shares the story of his successful efforts to put up an outdoor antenna in "HOAs and Antenna Restrictions: The 'Full Disclosure' Approach." With sunspots returning and HF propagation starting to heat up, Bill Karle, VE4KZ, offers a tutorial on different ways of estimating propagation in his article, "Fishing for QSOs." 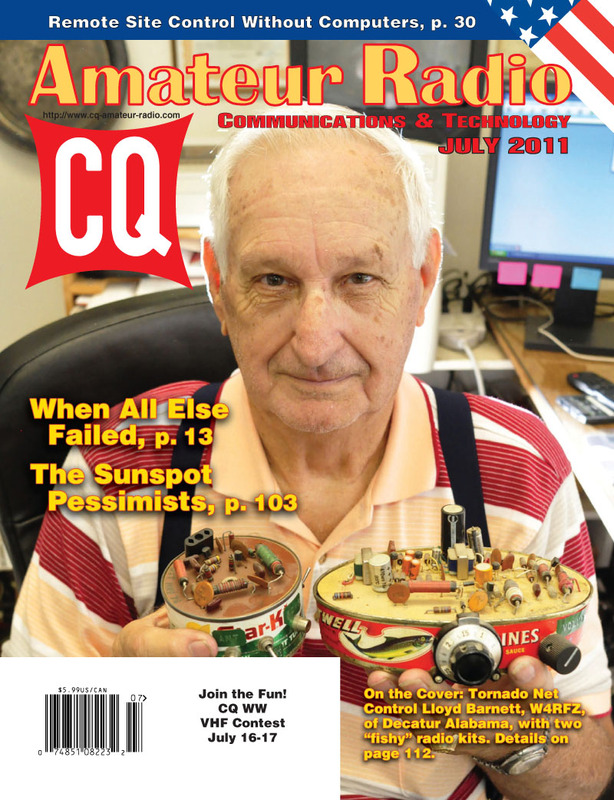 The July issue also includes a listing of this year's inductees into the CQ Amateur Radio, Contest and DX Halls of Fame. This year, we have 12 new members of the Amateur Radio Hall of Fame, which is celebrating its tenth anniversary, as well as one new member each in the DX Hall of Fame and the Contesting Hall of Fame, which is celebrating its 25th anniversary. Congratulations to all! Among our columns this month, "Math's Notes" editor Irwin Math, WA2NDM, revisits the classic Kenwood SM-220 station monitor, with some mods to reduce drift and improve sensitivity; "Washington Readout" editor Fred Maia, W5YI, answers questions from the mailbag, and "Magic in the Sky" editor Jeff Reinhardt, AA6JR, looks at the "Turf Wars" over radio real estate - a subject tied directly to this month's editorial. 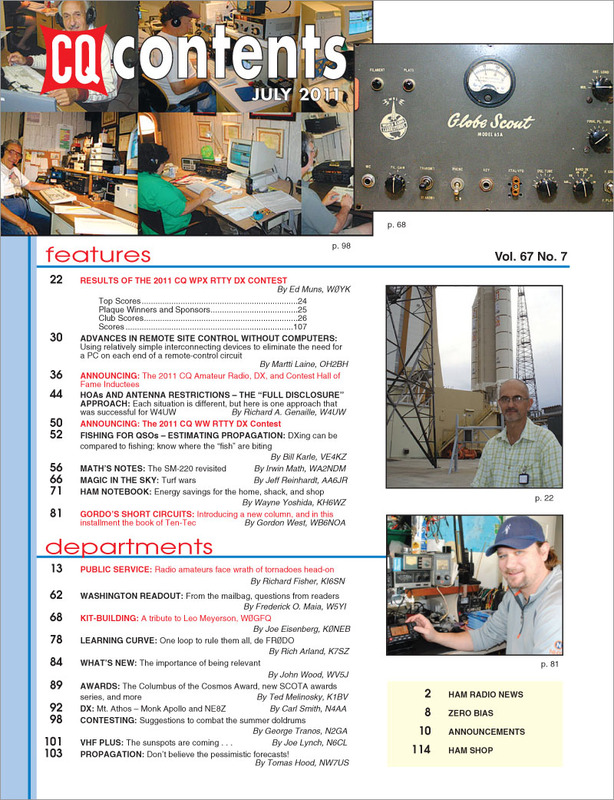 Kit-Building Editor Joe Eisenberg, K0NEB, takes a time-out from his usual subject matter to offer a tribute to his personal ham radio mentor, WorldRadio Laboratories founder Leo Meyerson, W0GFQ, who became a Silent Key this spring, shortly after celebrating his 100th birthday. Joe also notes the introduction of a special 35th-anniversary edition of the famed Tuna Tin 2 low-power transmitter kit. "Ham Notebook" editor Wayne Yoshida, KH6WZ, offers tips on saving energy at home, in the shack and in the workshop; "Learning Curve" editor Rich Arland, K7SZ, continues his assault on "Lord of the Rings" puns with "One Loop to Rule them All," and New Products Editor John Wood, WV5J, writes on "The Importance of Being Relevant." Next, we introduce a new column, "Gordo's Short Circuits," by long-time Contributing Editor Gordon West, WB6NOA. There's no particular theme to this column except that anything in it will be something that has caught Gordo's attention and that he feels will also be of interest to CQ readers. Expect just about anything here! Awards Editor Ted Melinosky, K1BV, introduces the "Columbus of the Cosmos" award in honor of the 50th anniversary of the first manned space flight by Cosmonaut Yuri Gagarin in 1961; DX Editor Carl Smith, N4AA, reports on NE8Z's trip to Mt. Athos and his visit there with Monk Apollo, SV2ASP/A; and Contesting Editor George Tranos, N2GA, offers tips on contests to help you "Combat the Summer Doldrums." Finally, we look to the sun as VHF Editor Joe Lynch, N6CL, reports on the rising sunspot cycle and its potential effects on VHF DX openings, and Propagation Editor Tomas Hood, NW7US, says "Don't Believe the Pessimistic Forecasts" you may be hearing about the intensity or duration of the new solar Cycle 24. That's a brief look at what's coming up in the July issue of CQ magazine, which should be on newsstands and in subscribers' mailboxes by late June. For information on becoming a CQ subscriber, click here!